ASHEVILLE – For the first time in years, the parking lots are full again at 800 Brevard Road. By 8:30 a.m., mother-and-son duo Cindy Cox and Trevor Cox were already standing in the growing line outside of Rack Room Shoes, which was giving away $35 gift cards to the first 50 customers. The footwear retailer is just one of the 55 stores at Western North Carolina’s first outlet shopping center. The pair joked that they came with a mission to find deals and take advantage of all the opening day freebies. However, at the 9 a.m. ribbon-cutting ceremony, city and county officials listed other reasons for why they were standing outside the Asheville Outlets an hour before it opened. According to an economic impact study by New England Development completed in fall 2013, the Asheville Outlets will add an estimated $8.3 million a year in tax revenue on both the state and local levels. The study also indicated that federal tax revenues are expected to increase by $7.1 million annually thanks to the shopping destination. Standing in front of the south entrance of the Asheville Outlets, Hunt reflected on the gray-colored Biltmore Square Mall that used to stand there. At the ribbon-cutting ceremony, Kit Cramer, president and CEO of the Asheville Area Chamber of Commerce, held up her purse and a large, reusable Asheville Outlets shopping bag. Speaking after the ribbon-cutting event, Douglass Karp, the president of New England Development, said this is not the first time his company has breathed new life into the site of an old mall. Karp also said that the architect of the project tried to look at Asheville’s architecture to inspire the look and feel of the open-air center. “It is a mall, but I think it’s more than that,” he said. Inside the Nike Factory Store, Asheville resident Cedric Short contemplated the wall of orange shoeboxes before him. He already owns 12 pairs of the brand-name shoes, but he said he is always looking for more to go with his outfits. As he shopped, he wore a pair of Nike Air Max. The father of three children said he was the only early riser in his family for the Asheville Outlets opening day event, but he expects that they will all be back to shop at the new retail center as a family. Tourists are also expected to be frequent shoppers at the Asheville Outlets, which is just off Exit 33 on Interstate 26. According to the North Carolina Division of Tourism 2013 Visitor’s survey, compared with all of the state’s overnight travelers, visitors to the mountain region participated in a greater number of activities during their trips to the Tar Heel state. Shopping, outpaced only by rural sightseeing, was the second most popular activity for visitors to the mountains, according to that same survey. During Thursday evening’s “Open Doors. Open Hearts. Charity Preview Night” event, about 4,000 people came out to shop a day early. All of the $20 ticket proceeds went to 20 area charities. Though there was some rain Thursday evening, it didn’t keep people from shopping. Sharon Morgan, Asheville Outlets general manager, said she was proud to be the very first mall manager at the retail center. 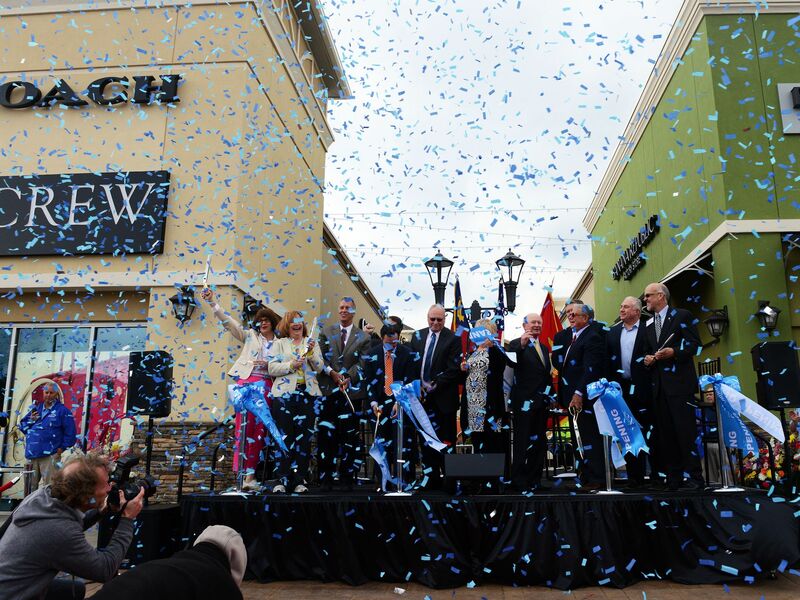 “It’s been a pleasure working on this project for the past year, and I look forward to welcoming all of you in the days to come,” Morgan said about 20 minutes before blue confetti shot into the sky in celebration of the opening of the Asheville Outlets. After the ribbon-cutting event, David Gantt, chairman of the Buncombe County Board of Commissioners, walked around the Asheville Outlets for the first time. Holding a shopping bag in one hand, he said that about a decade ago, county commissioners considered moving all county offices to this site.